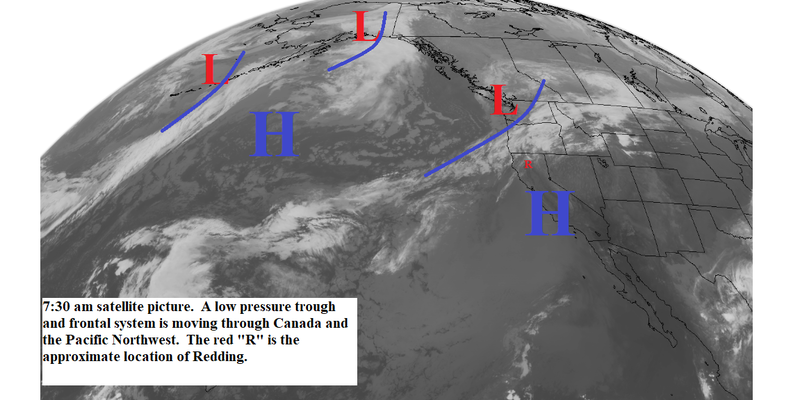 This morning's satellite picture (below) shows a frontal system moving into the Pacific Northwest. We will see a few clouds from this system today and early Sunday. A couple of weeks back the extended forecast models were hinting that the jetstream might continue to drop southward and we could see cooler weather and maybe a few showers. However, about a week ago they shifted and showed the jetstream heading back north. Monday through the end of the week will be under a weather pattern like the one shown on the map below. 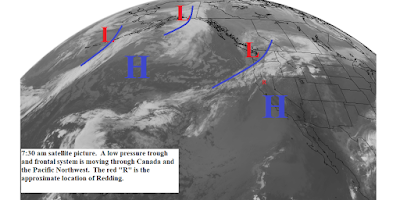 A high pressure ridge will be along the coast. Northern California will have mostly clear skies and above normal temperatures. Tuesday looks like the warmest day with high temperatures about 10 degrees above normal. Gusty north winds will occur late Monday and Tuesday. Longer range models show the low pressure area shown out to the west on the map below moving closer to the coast next weekend or early the next week. This would bring cooling and maybe some mountain showers.